A road trip vacation called for one thing- new comfy pants! And when there is snow still in the forecast you go for the warmest, coziest pants you can find. These Love Notions Resolution Joggers in fluffy Raspberry Creek sweatshirt fleece couldn’t be better! This post contains affiliate links. When shopping through them I receive a small commission, thank you! This french terry sweatshirt fleece is just about the warmest, fluffiest fabric ever. My little guy found a scrap of it and is begging for his own pair. He declared it the softest fabric he’s ever felt. There is minimal stretch but it worked great for this pattern with a little modification. I used a different cotton/spandex french terry for the cuffs and added 2″ elastic to the contoured waistband for more stability. I also added the drawstring for a sporty look. I used the tutorial in the Resolution Sew Along to add velvet ribbon down the side. I’ve been crushing on all the side stripes I’m seeing everywhere these days and this was such a simple addition that totally added that ‘wow’ element to these pants. The Resolution pattern comes with jogger, yoga pant, and legging options. I was a bit nervous when attaching the jogger calf pattern piece to the upper pant option of the pattern. It creates a defined angle at the knee that I was worried would mean strange-looking legs. I subtly curved my piece a tiny bit and crossed my fingers. At this point I really should just trust those Love Notions ladies! The final result is a great fitting pairing of joggers. That back yoke detail is super flattering and a great place to do a little fabric mixing too. These pants were so perfect for our snowy drive and have been in constant rotation since. Utah spring still brings snow and chilly temps so I know I’ll get more use out of these this season. My jogger obsession continues and I’m happy to have finally sewn up this pattern. I know I’ll use it again and again! Today I’m sharing a couple of women’s suits for ya’! I’ve been loving all the brave beautiful women in their handmade suits this week and now it’s my turn. It’s amazing to have gorgeous handmade suits in your closet but posting those suits for all to see is a little intimidating and oh so vulnerable! With great fabrics, stellar patterns, and a little bit of power mesh it was a little easier to bring out the inner swimsuit model in me, lol! I used a couple of my favorite swimsuit patterns and did a little pattern hacking as well to get two suits I can’t wait to wear this summer. I have a whole Pinterest Board full of adorable swimwear inspiration for the whole family. I’m loving all the wide vertical stripes I keep seeing and wanted to recreate this Gap swimsuit. This vertical stripe swim print was just perfect for it. I used the Mairin Swimsuit from Sew A Little Seam. I wanted a basic one piece suit with no bells and whistles. The Mairin is so full of options that it felt a little strange to go with such a basic option. I’ve decided my swim collection is full of ‘adult beach vacation’ suits and not enough ‘family pool time’ suits, if you know what I mean. I was in need of a suit I could throw on and not worry about coverage. This suit totally fits the bill. I used the mid cut lines for everything from the scoop neck to the back to the leg rise creating a modest suit that I feel so comfortable in. I added bra cups and an elastic shelf bra to the lining. I also added a layer of power mesh between the lining and outer swim fabric as well (I cut it from just under the elastic bra line to just above the leg opening). Paired with board shorts from our last Suit Up Tour, I’m ready for a day of swimming with the kiddos. I used the Gracious Threads Swim and Surf Shorts and I wear them constantly! I love a little extra coverage and I turn to this pattern again and again. Modifying the Wiggle for swimwear was a pretty easy task. I used the size I fell into and cut it at the crop top line plus an inch for the hem. In the future I think I’ll add more length so I can wear it a little higher on my shoulders and still cover my tummy. I added a lining with soft bra cups to the front bodice. Otherwise I constructed the top per the pattern instructions and it worked brilliantly. I’m the worst pattern hacker and I’m so glad this turned out to be a no-brainer! I have a feeling these simple black bottoms will go into the rotation with so many of my other swim tops. I love the fit and coverage! I’m so thrilled to have these suits to turn to once pool season arrives. These fabrics were such a treat to work with and I’m loving the huge variety I have to pick from. I’ve got my eye on so many more prints I think my own swim collection will be growing this summer. Today’s bloggers joining me on the tour have killed it with their own looks. Make sure you check them out and don’t forget to take advantage of the incredible discounts from our awesome sponsors! Make sure to check out the other bloggers on the tour today! For this week, March 11-15, 2019, our readers can enjoy 20% off SWIM ONLY from these sponsors! Day three of the Suit Up For Summer Tour is here! I’ve got a little blog miracle happening today- you get to see a rarity around these parts. My oldest is joining in the fun! He’s headed to the sun for spring break this year so he was happy to get a new swimsuit. I love this classic Leaf Outline boardshort print. It’s a print that works great for everyone and looks fantastic with a little pop of color. I used the 5 out of 4 Men’s Swim Trunks with a couple easy modifications. He wears a mens medium in ready-to-wear and fell right into the size medium for these too. I always think that’s helpful especially when sewing for others. I added grommets to the outside so we could see the functioning drawstring. I also shortened the length per his request. The pattern is a fairly quick sew and the tutorial was very straightforward. I needed a sewing win and these delivered! These trunks will work so great for him. They can go from the pool to the hamburger joint no problemo! That’s five kiddos in mama-made swimsuits! We better hit the pool stat! I’m so grateful for RCF that I could get fabrics that speak to each of their personalities and tastes. I love that they can coordinate without being too matchy matchy (they would die of embarrassment at this point!). Have you been speechless at the amazing suits this week? I can’t get over the incredibly cute looks each and every day. Today is no exception! We’re here on Day Two of the Raspberry Creek Fabrics Suit Up For Summer Tour. After yesterday’s fantastic posts I now have a list of swimsuit patterns to try out for myself! So much cuteness! Today I’m sharing a couple of girls swimsuits but first let me tell you a little story full of high hopes, dashed dreams, seam rippers and caffeine. There once was a mom who dreamed of making swimsuits for her little princesses because they struggled fitting into just any old swimsuit. She knew custom swim gowns were in order and knew she could call on her years of experience to make their wishes a reality. Fast forward to many long afternoons and unpicked seams later and their mom was hoping for a visit from the sewing fairy godmother. Back in reality we find the heroine left with mediocre fruits of her hours of labor. Guys, I’m here to tell you not everything that comes off your sewing machine will be a prize winner. And even though I’m supposed to be here to share my infinite sewing wisdom with ya’ll, sometimes things just don’t go as planned. This cute girly LOVES rashguard suits. She fell in love with this geometric print and I knew it’d be perfect for the look she wanted. I used our favorite girls raglan pattern, the Camden Raglan, from Hey June Handmade. It’s our go-to for jersey tees and I used it for last years suit as well.. I sewed it up in a flash and all looked great until she tried it on. The neck was way too wide for a true rashguard look, the vinyl was too low, and I had kept the length I usually add to her tees so it was a good two inches too long. So off went the neckband and I seam ripped the whole front off and recut it to bring the vinyl up. I then sewed on a new, wider neckband that was a touch shorter to bring in the shoulders as well. The final top is fantastic and I’m glad I took the time to get the look right. I used a file found in Cricut Design Space for the graphic and Cricut SportFlex Iron-On for the perfect summer time look. I used SportFlex Iron-On last year for some rashguards and it held up so well to hours in the pool and lots of washing. It’s a great product if you’re looking to customize your swim or workout wear. We did a pair of boyshort bottoms using the Rissa Hipster Boy Shorts from Plucky Butterfly. I love the cut of these and think they look darling on her. They come together quick and the pattern is so full of options from undies to skirted swim bottoms. As soon as I saw these stripes I knew I wanted to revisit the Azur Swimsuit from Titchy Threads. I had sewed this pattern once before but never finished it due to fit issues and my own errors. Surely I could conquer it now with more experience, right?! I’ve mentioned earlier that my girls don’t fall into standard size measurements. I need to blend sizes and add length to most everything I make. This swimsuit proved to be a challenge to get right. I adore the cool retro style. It’s fully reversible which makes playing with fabric combos so fun. All errors with this suit are purely my own issues. It’s a fantastic pattern and the instructions are well written. Sometimes I think I’ve been doing this long enough I can wing my way through projects. This time I read over the tutorial multiple times before beginning but only referred to it here and there while actually sewing (tell me I’m not the only one who does this?!). I forgot to leave an opening in the leg hole and ended up turning my whole suit through the tiny neck straps, talk about a tight squeeze! Once I’d made the turn there was no going back 😉 The elastic could be tighter across the sides and I really should have used the optional back strap. I may eventually seam rip it and adjust things to get a better fit but have decided to leave it for now. This sporty style suits my oldest much better so I may try to make the adjustments for her instead (bonus when both girls have almost identical measurements except for height!). You win some, you lose some. I’m grateful for these little misses that keep me on my toes and definitely keep me humble. Sometimes things turn out exactly like you envision them and sometimes you chalk them up to learning experiences. There is no growth in comfort and failure breeds wisdom- not necessarily what we would choose to experience but helpful to think about as we go through our own little challenges. In the end I couldn’t give up my dream of coordinating sibling looks. I love these fabrics together. I love that the fabric designers use the same colors so that many of the prints throughout the whole collection play so well together. This teal and pink combo just screams summer to me. Make sure you’re keeping up with all the stops on the tour. I can’t believe the talent that I get to be a part of! We’re kicking off a fun and exciting blog tour today! 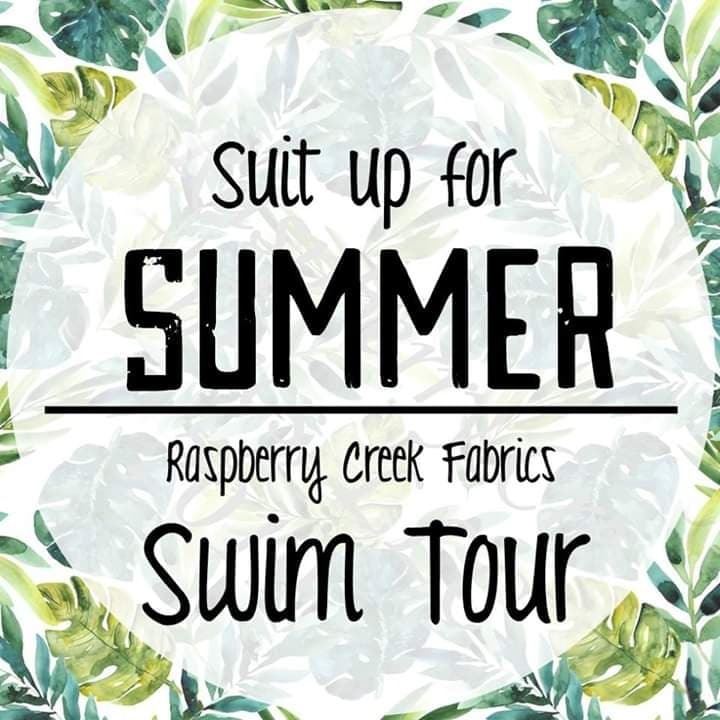 I’m so excited to be cohosting the Suit Up for Summer With Raspberry Creek Fabrics Swim Tour with Karly of Paisley Roots. Karly and I hosted the Suit Up for Summer Tour a couple of summers ago and I’m thrilled to be sewing up swim again! This time we’re so happy to be featuring Raspberry Creek Fabrics newest swim collection. There are so many prints to choose from and you can grab them on sale through Wednesday, March 13th. I’ll be bringing you posts all week, highlighting different aspects of swimwear sewing each day. Today I’m happy to showcase sewing for the boys in your life. These two kids were thrilled to have new coordinating suits just in time for our spring break. Charlie loves the color teal and picked out this classic gingham board short fabric. The Raspberry Creek Fabrics Facebook group has gone nuts for the new Swim Boardies pattern from Lowland Kids and I jumped at the chance to sew it up. I love when pattern releases and fabric releases seem so serendipitous! I sewed up a size 6/7 according to his measurements and love the fit. They’re short and really show off his cute little legs. He just turned 7 and I know he’s about to grow out of the ‘little kid’ stage but I’m happy to milk it as long as possible! This guy is just on the brink of out growing boys patterns. I was planning on using my go to boys swim pattern, the Linden Shorts and Add-on Pack, but realized his recent growth spurt put him just out of size range (hooray for him, sad for me!). I turned to my trusty Love Notions Patterns and the Kayak Boardshorts. He fit perfectly into the size 14, hallelujah! I did a little pattern hacking to get the look he was after. I cut them mid-thigh per his request- not too short and not too long. The Kayak’s call for a knit waistband but I used the board short fabric and just cut it to fit the waist of the shorts, adding grommets and a drawstring to the waistband. I also added a swim liner, using the 5 out of 4 Men’s Swim Trunks liner. Sewn up in Striped Flamingo Board Short it’s the perfect swimsuit to keep him looking cool and on trend. I hope you’re excited for a week of incredible swimsuit inspiration! You’ll see kids suits, women’s wear, learn new tips and tricks, and just be awestruck by the amazing bloggers joining the tour. I can rarely pass up a blog tour opportunity. I love the chance it gives me to try new patterns, play with pretty fabrics, and the deadline is always a big motivator to get me in my sewing room. I was especially thrilled to join in the Basically Jalie Blog Tour hosted by The Petite Sewist and Auschick Sews. Jalie is known for their impeccable drafting, huge size range, and classic designs. Speaking your love language too?! Make sure you read to the end of this post for all the blog tour goodies- giveaways, sew-a-longs, and soooo many incredible bloggers joining the party! I’ve had my eye on the Mimosa Scoopneck tee (3890) since it’s release. It’s full of options- multiple sleeve styles and lengths including plain short sleeves, tie short sleeves, flutter shoulder ruffles, and long sleeves. My favorite part of each sewing project is sitting down with my kids and picking fabrics and pattern options. I love to see what they gravitate to and it makes it so much more likely they’ll get lots of wear when they’re part of the design process. My spunky Payton went for florals and ruffles. She’s still super girly and usually picks all the extras- ties, ruffles, ribbons, you name it. For this top, I dug deep into my Raspberry Creek Fabrics stash for a print I’ve been saving FOREVER. It’s one of my absolute favorites (I love anything on grey!) and I’d been keen to use it for myself. One of my goals this year is to CUT THE FABRIC, you know those ones too pretty to actually use… I’ve decided it’s soooo much better to see it on my kiddos or in my own closet than just sitting on my shelves. Remember, there’s always more fabric! My oldest seriously kills me with her fashion taste. She tends to be more classic and dresses like a cute college kid and not your average 5th grader. It was no surprise she picked one of my new favorite fabrics, this dreamy modal jersey stripe from Cali Fabrics. It’s so incredible soft and those stripes are just perfection! My girls measured into the same size for their chests which made it super easy. For Payton, I added an inch to the size L (8) bodice and sleeves and Sophie got 2 inches added to the bodice. There’s a lenghten/shorten line which made it easy peasy! Sewing these up was very straightforward and the instructions are so clear. I love that you can download the pattern instructions before purchasing the pattern. If it looks too complicated or time consuming you can skip it but I’ve always found it just the opposite! Looking over the tutorial beforehand gives me the confidence to tackle a new project. My little guy lives in raglans and I’ve been hearing the greatest things about the Nico Raglan (3669). I’m thinking a boys raglan comparison post needs to happen soon. I have four raglan patterns that I rotate through but I think we may have found the winner. Just look at that neckline alone! The slim fit just fits this kid so well! I did a size J (6) with a little length added. He’s generally in a size 7 height and measured into a size 5 chest, 6 waist, and 4 hip in this pattern. Is he my kid or what?! I’ve found that Jalie patterns tend to run on the slim side which works really well for my kids but might be something to consider. My older boys like things a little looser and I usually size up a couple of sizes for them. His shirt is all cotton jersey from Raspberry Creek. He would have only teal in his closet if it were up to him and I’m happy to oblige. I used this triangle print (retiring this week!) for the sleeves and it’s been one of my favorite boy fabrics to date. I struggle finding just the right prints for him. He’s too big for most of the boy fabrics I find in the stores but RCF keeps him pretty well taken care of. Ready for the good stuff? Are there some Jalie patterns you’ve been itching to get? Now’s your chance to WIN YOUR JALIE WISHLIST! Head over to Jalie’s website, create an account, add your favorite patterns to your wishlist, and complete the rafflecopter form below (patterns must be added by February 12, 2019 11:59pm EST to be eligible). Incomplete entries will be eligible for fabric prizes only. For extra entries, join our Jalie sewalong! Make a Jalie “basic” between January 28 and February 12 and share it on Instagram with hashtag #basicallyjalie and/or in the Basically Jalie Album in the Sewing with Jalie Facebook group. 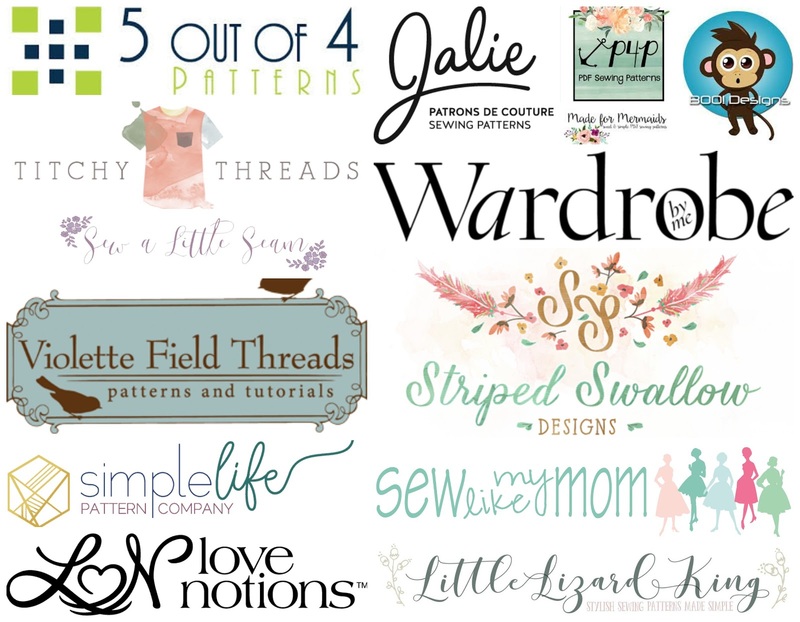 Win Your Jalie Wishlist – Up to $100 CAD in patterns! Win Your Jalie Wishlist – Up to $25 CAD in patterns! I always love the chance to sew up the newest CLUB lines from Raspberry Creek Fabrics. My kids LOVE the comfy soft CLUB fabrics and get excited to come up with ideas for all the new prints. There are so many cute prints to choose from in the latest Easter and St. Patrick’s Day collections. We got to work with three different fabrics and had fun coming up with coordinates and creating unique looks that suit their personalities. First up was a Samson Sweater from Love Notions for Charlie. He loves a good graphic tee and thought this ‘Lucky’ vinyl was the coolest! I used St. Patrick’s Argyle in French Terry paired with Light Heather Grey French Terry and Black Cotton Jersey also from RCF. I’ve been loving all the slightly cropped boxy sweatshirts in the shops lately and the Samson was perfect for recreating that look. I sized up one for a looser fit (this is an 8 and his chest is a 6 but he’s generally a 7 or 8 for height). Next up is a raglan with a twist. We absolutely love raglans at our house and I instantly fell in love with the new Aurora Raglan from Sofiona Designs. Sherri of Sofiona Designs is a fellow Project Run and Play alum and I’ve always been a big fan of her style, classic but with a modern edge. The Aurora Raglan has a couple of fun features but I knew we just had to do the ribbon shoulder ties with this fabric. It’s such a youthful touch but done in a soft, solid fabric the ties can also look sweet and sophisticated. For this top we used the Rainbow cotton jersey paired with royal blue cotton jersey. I picked up the rainbow ribbon from Hobby Lobby. It’s such a bright, happy combination that just suits my little miss sunshine! I couldn’t let any scraps of that rainbow go to waste so big sis got a tween friendly hoodie. I used my favorite Light Heather Grey french terry and went to town with the vinyl and ribbon trim. We both LOVE ribbon trim on sleeves or pants and this rainbow ribbon is such a cheerful addition to an otherwise plain top. I used our trusty Constance Sweater from Sew A Little Seam. It’s so full of options. For this version I did the regular sleeve with hood and cropped it a couple of inches. I left off the bottom band and let the hem roll a bit then tacked the side seams to keep that rolled hem in place. It needed a little something on the front so I cut strips of vinyl and applied a lucky clover on top. An easy addition that makes this such a cheerful top that is so on trend too! I did one more quick sew for this guy. Another raglan, surprise surprise. He picked out all the elements- coordinating fabric (he loves this teal! ), neckband, and sleeve length. I’m surprised he’s on a 3/4 sleeve kick but I think it’s perfect for transitioning into spring. We used the Ringer Raglan from Thread Faction because I love the slim fit. In the Easter Stripes this top makes a great addition to his everyday wardrobe. The best part of working with Raspberry Creek is the wonderful community behind it. We had a blast getting together with a few of the other strike off sewists for an epic photo shoot! Just look at all those cute kids! It was the best kind of chaos and I left feeling so inspired and in awe of all that talent in one room. You can grab all your favorite Easter and St. Patty’s Day prints on sale through tomorrow, Tuesday February 5th. They’ll stick around in the shop through each holiday before they disappear for good!